Packing dishes and glasses before moving house is half of the packing process and many people prefer to do it themselves. If you do it properly, you will not worry about broken expensive plates and glasses during loading or transportation. 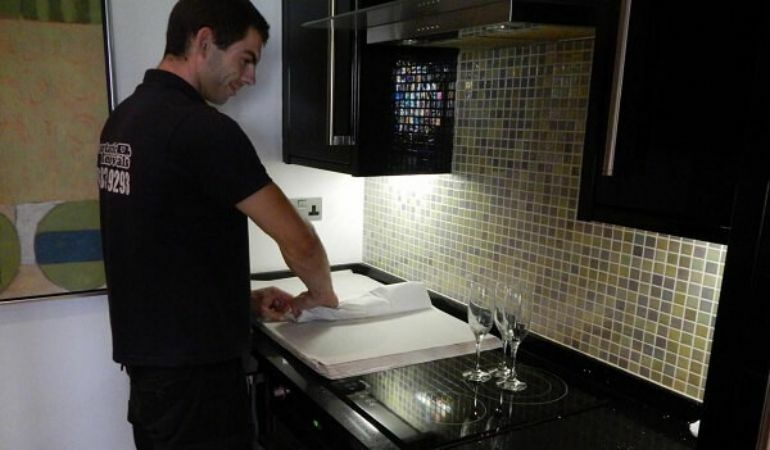 Use a flat and solid work surface on which you’ll do the packing. Cover it with packing paper or newspapers. Get papers wide enough for the plate you’ll be packing. The size is good when there aren’t any parts of the plates left exposed. Put the plate at the centre of the paper sheet and gently fold one of the corners until you cover the whole plate. Then, place another plate on top and cover it with one of the remaining edges. Do this 4 times until the whole sheet is used to its full potential and all four plates are fully wrapped with the paper. The most general rule is not to place plates flat inside cardboard boxes, always put them on their sides. Use as much paper or other soft material at the bottom of the box and on its sides. Stack the plates together, putting each next on top. Lay the stacks on their sides until the whole box is filled. Don’t leave any free space in the box, the plates should be unable to lean on their side. If any gaps appear inside the moving box, fill the free space with some paper. Label the top and bottom side of the box after sealing it. 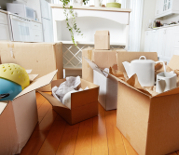 Leave a “fragile” label and set the box aside – it will later be loaded into the moving van. А dish barrel is one of the most efficient and easy way to pack plate when moving out. Usually, a dish barrel has a capacity of approximately 5.6 cubic feet, which is perfectly enough to accommodate all of your kitchenware inside of it. Put heavier, solid items on the bottom of the dish box. Things like bakeware and frying pans are perfect for the job. Anything with higher density made of metal will serve as a good foundation of the box, ensuring the preservation of the items on top. Finish with packing paper on top. Use the middle section of the box for kitchen appliances and glassware which is thick. Vases and beer mugs may be placed in the middle layer of the dish box. If you want to provide additional protection to the glassware, use a cell pack with the size of the dish barrel. Before putting on the top layer there should be some free space yet. Pack this section of the dish barrel with more free space and use towels, newspapers or packing paper to fill it. Items such as glassware, kitchen utensils and plastic kitchenware would fit well in this layer of the dish box. Prepare the dish barrel’s top layer for packing. Make sure the 3rd layer was well finished with enough packing paper or bubble wrap which will protect the items on top. Whatever you place on top of the other 3 layers, make sure it’s lighter than the items below. You want the heavier things at the bottom and the lighter stuff – progressively placed on top for efficient weight distributions. If you achieve this, the whole weight will be supported by the solid bottom and the fragile stuff on top will not be pressed by anything. Finish the dish barrel’s top with packing paper or bubble wrap, then seal it carefully. Label the box if necessary. If you’ll be using the services of a moving company, we suggest you label the box, so the movers are aware of its contents. Use clothes made of soft fabric for support at the bottom of the suitcase and the free space inside your luggage. Wrap plates in packing paper or bubble wrap. Do it one by one, so there is no contact between their surface. Don’t wrap dishes and plates too tight, it will only make them more prone to damage. Whatever important you may possibly need during the move, don’t place it beneath the plates. Use the top layer of the luggage for it. You need quick access to your phone, keys, and medicine, be cautious of these three and don’t put them at the bottom of your luggage. If you sense there is improper weight distribution anywhere in the whole bag or suitcase, make the necessary adjustments until you achieve the desired balance and amount of pressure on the items inside. Whatever guide on how to pack plates you read, you’ll most certainly be advised to use packing paper and there is a reason for this. When not folded but simply crushed in a ball, packing paper absorbs shock as good as any specialised material for the purpose. The difference is that the packing paper is a lot cheaper. It’s also considered as not reusable, which is untrue – just most people prefer not to store a used packing paper at their home. When you finish your move and unpack successfully, don’t throw the packing paper, you can reuse it later. Instead of throwing it away, try to utilise it as decoration or for something else until you need to pack a mailbox or moving boxes for your next move. It’s one of the best materials for the bottom of moving boxes. Check the bottom if it’s secured good enough with duct tape for support before laying the packing paper. When packing items with paper, place it in one of the corners, then fold each of the corners one by one until the object is fully wrapped from all sides. You can replace packing paper with paper from newspapers or magazines. Towels and bubble wrap are also a suitable replacement. After unpacking dishes and plates which have been previously packed with newspaper, wash them again to remove any ink marks. Feel free to add anything else that may possibly help you. Reinforcing the cardboard box is possible if you wrap a thin rope around it, in case the duct tape gets off. You can also use blankets by wrapping them around the dish barrel if you’re worried about the box. Getting the dish box packed properly and fast also affects how long it will take you to move house. The standard size of a moving box is 355 x 355 x 355 mm for the medium-sized boxes and about 457 x 457 x 457 mm for the large ones. You should be very careful not to exceed a weight of more than 20kg when packing a moving box as it’s not designed to hold loads higher than this. To make sure you’ll get the type and amount of boxes you need, don’t hesitate to tell your expectations and preferences to the consultant when you’re booking the moving boxes and packing materials delivery service. The operator will tell you if they have the type of box you need. If they don’t have a separator for glasses, don’t worry – wrapping each glass in packing paper will provide the same effect as using a cardboard divider. Packing ceramic plates isn’t something that should cause trouble. Before doing it, though, we suggest you get more informed on why plates made of this material are fragile. Understanding this better will help you take good care of anything ceramic. The particles inside the ceramic material cannot shift easily as they do in metal. This is because of the specifications of the ionic and covalent bonding mechanism. They make you unable to notice any deformations. Once damaged, ceramics can hardly get repaired. It’s not impossible, though. There is a Japanese technique for repairing broken pottery known as Kintsugi. Instead of disguise, the repair on the visible damage of the pottery is to be part of its historical past. This feature adds to the value of the object sometimes. Bubble wrap works well when packing ceramics, the air inside the bubble will absorb the pressure from any external sources. Thus, the pressure will not be transferred to the ceramic plates. Wrap each plate with some bubble wrap and finish with duct tape, then stack each on top and seal inside the moving box. Prepare the bottom of the moving box by laying lots of crumpled packing paper. Place larger china dishes on the bottom, it is firmer and will sustain the heavy load from what’s on top in case there is enough packing material to reduce the pressure. Make bundles, each of 3-4 dishes, each packed separately, then secure the bundle with more packing material on each side. Continue filling the box with bundles of China dishes. Keep reducing the weight of the bundles progressively until you reach the top side of the box. Fill any gaps inside before finally sealing the moving box with duct tape. Wrap each large dish individually instead of making a stack. It’s tempting to do, but don’t try to put more than one dish or glass in a single piece of newspaper. For glasses, lay the paper of choice out flat, then starting at one corner, roll the glass diagonally across the sheet. Tuck ends into the top of the glass. For dishes, lay the plate or bowl in the center of the sheet, then fold in all sides. Make sure the item is completely covered and use packing tape to keep the paper in place if necessary. For huge things like vases or lamp bases, you may need multiple sheets. When packing wine glasses to move, make sure you provide enough paper around the stem so that it becomes as thick as the goblet section. 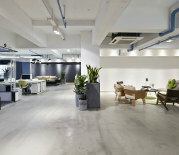 The key is never to have open space inside the box where items can move into one another. Anyone interested in dishware and glassware knows Corelle. It’s a brand that makes dishes from a tempered glass and has been on the market for almost 50 years already. A standard Correlle plate has a diameter of around 26cm and a weight of about 12 oz. (350gr.). Pressed glass is really thick and will handle pressure on top as long as it is distributed properly. Your highest concern when packing Corelle plates is dropping the moving box or hitting it on the side with something heavy. Just follow the general packing tips for dishes when dealing with Corelle plates. There isn’t anything special you have to do apart from taking a good care during transportation of the box or notifying the movers to do so. When packing dishes for storage, take into account the fact that they will remain inside a cardboard or a plastic container for some really long time. Humidity or cold temperature may cause issues if the dishes are made of a material not resistant to the elements. If you agree to spend some extra money on wooden crates for the storage, it may turn out to be very beneficial. They are big enough to store multiple moving boxes and the wood will protect the boxes better than just leaving them on a shelf. We suggest you contact a professional storage service provider who’ll give you more information and advice on how to store your dishes. If you use cardboard containers, add extra support to the edges and the corners of the box. You can use duct tape for the purpose. Make a small stack of plates and place it on its side with the bottom of the plates pointing at the side walls of the box. This way you’ll minimise the free space and the stacks will be stable during transportation and lifting. Label the boxes and add the date when they were put into the storage. If there are any products with an expiration date inside, you better take them out so they don’t get spoiled inside the storage. Place the boxes inside the storage container strategically. Leave boxes with essential items close to the entrance of the storage in case you have to unseal the container. You won’t have to take everything out to get access to the storage. The core principles of successfully packing dishes for a long distance move are already described earlier in the post where we explained how to pack plates in a dish barrel. 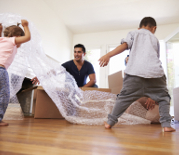 A common mistake we see during large-scale moves at a longer distance is that some families decide to cut costs on moving boxes. Instead of buying and properly packing a dish barrel with all their plates and glassware, they try to find cheaper, used boxes. It’s easy to find free moving boxes, however, we do not recommend you do this for a long distance move. 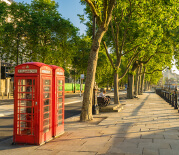 Used moving boxes are often scruffy and worn out to an extent that they may pose a threat to your items. If the bottom fails, you’ll end up with plenty of dishes or glassware broken at tiny pieces. Most certainly you won’t be able to restore them afterward and will have to throw them away. You can use any towel as long as it fits inside the box but still leaves enough space for the dishes. Use it for wrapping the dishes with it. Will be a lot harder to remove it than the newspaper but is a simple solution if you don’t have any alternative at the moment. Underwear and socks are the ultimate replacement of towels. You can use small clothes to fill the gaps in the moving box so the glasses don’t collide inside the cardboard container during transportation and lifting. Apply extra duct tape at the bottom of the moving box to prepare it for heavier weight. Wrap anything fragile with the bubble wrap. 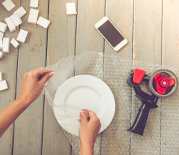 If you can’t stuff the free end, use duct tape to prevent the bubble wrap from unwrapping or getting loose which may expose the dish to damage. Place the dishes inside the moving box gently and slowly. If you’re worried that the box will be left on a solid surface, you can leave a layer of bubble wrap at the bottom for extra protection. You don’t have to fill the extra space inside the box with anything as long as you have placed the wrapped items correctly and the box is almost full. If the only small capacity of the box is taken, consider filling the rest with packing paper. Start with the standard procedure of re-taping the box, this time don’t do it just for the bottom, add additional support to the edges as well. Pots and baking dishes are usually made of metal so they are heavier than standard dishes. Wrap in packing paper any other kitchenware and put on the bottom of the box. You will want to unload the box by removing the fragile pots on top and then proceed with the heavier and less fragile stuff at the bottom. Add an extra layer of packing paper on top of the packed kitchenware, positioned on the bottom of the box. Label the box as “heavy” to warn if others have to carry it later. Carefully take a look of each piece of glassware before packing it. You can lay down all glasses you want to pack on a flat surface like a table or a larger bed. Go individually through each glass and take a closer look at any cracks or visible damage on the glass. Put away anything that looks suspicious as it may cause a lot of ussies during the move if it breaks inside. Anything that is too expensive should go into a separate moving box. The rest of the glassware, as well as other items such as vases, can be stacked inside the primary box with glassware. Take extra care of the most expensive glassware and better transport it to the new address with your own vehicle for maximum safety. Wrap the glasses and seal the moving boxes on a flat surface. Any imperfections due to lack of comfort during the process may result in broken glassware. Wrap each glass individually with packing paper. Find the most secure way to place the glasses inside the moving boxes, leaving only minimal amounts of free space. Fill the free space with packing paper. Seal the box perfectly with duct tape after finishing the top layer with bubble wrap. Label each box as “fragile”. It’s easy, just mind that when a newspaper is used, you’ll often need additional packing materials as some newsprints may colour your glasses if you don’t wrap with something clean first. Use the newspaper as a filler around the already packed glasses. The ink of the newspaper will leave marks on the glasses if they have not been packed with clean white paper at the start. Do not fold the newspaper just crumple it until it turns into a small ball of paper. Then use it in the gaps of the moving box to make the glasses static during transportation. Don’t spend money on a newspaper. If you can’t find any, simply ask a friend or a neighbour for some old newspaper they’ve stored. Mind that the newspaper may leave ink on your fingers. Try not to touch the glasses once you’ve interacted with the paper. Consider recycling the paper when you’re done with the house move. Try to reduce the amount of domestic waste you generate. Glass cannot deform and bend, thus it cannot sustain heavy amounts of pressure without breaking apart. It lacks an orderly crystalline structure. If you drop a glass object on a solid surface it will shatter but if you apply moderate pressure slowly, it will remain undamaged. Toughened glass is much more resistant than standard glass materials. It’s improved with additives which make it much more resilient while it’s primary qualities are still present, such as transparency. Glass also breaks when it’s heated at high temperature but you should not worry about this. The temperature in the atmosphere cannot reach such heights that will endanger your glassware of breaking. Internal defects, caused during the manufacturing process. Improper usage of glass material for the purpose. (such as making a very large glass from a very thin layer of material). A glass-like this would not be able to sustain an impact with a thicker beer mug for instance. Thermal, non-evident with the naked eye. Wine glasses are very thin, thus they get broken very often during transportation and house moves. Many people are unaware of how they should prepare, pack and carry wine glasses so they can unpack them in mint condition. Wrap the stem of each glass with bubble wrap. Put packing paper inside the glass but don’t stuff it too much. In case a glass gets broken, the paper will minimise the damage so you can hopefully repair it afterwards. Wrap the whole glass in paper and seal with duct tape. Use a cell pack inside the box and put each glass into a separate cell. If it can’t get inside because of its larger size after being wrapped, use 2 cells per glass. When all cells are filled, finish the packing process by stuffing as much packing paper as necessary to fill the whole moving box. Seal the box with duct tape as usual and reinforce it if it’s already been used before. Add labels so you know where to unpack it, those who’ll carry the box will also be alarmed of its fragile content. Make sure the glass gets into the cell pack without pushing it too hard. If you have to apply too much force, remove some of the packing paper around the glass and then return it to the cell pack with ease. If any cells remain empty, fill them with packing material. You want to have a box with no free space inside. When the box is fully packed, shake it a little bit to see if you’ll notice any movement of objects inside. If there is a distinctive noise of movable glasses, open the box and investigate the source. Add more paper if necessary and seal the box again until the content inside is firm enough. Packing beer mugs for a move is tricky. They are heavier and much more solid than standard glassware, which makes them unsuitable among the rest of your dishes in the moving box. Wash and dry the bugs before packing. You won’t have the time and effort for this after you move out with all the responsibilities you’ll have then. Prepare the moving box for the mugs. Use a new one, reinforce it with duct tape otherwise it may fail because of the mugs’ extra weight. You don’t have to use a cell box as the mugs are thick enough to sustain any minor contact with the rest of the glasses but consider using one if yours are more fragile or too expensive, extra care is always worth it. Add a layer of packing paper on the bottom of the box and wrap the edges with some using duct tape to stabilise it. Stuff each mug with paper and then wrap it with the same material until it’s fully protected. Cover the whole bottom layer of the box with the wrapped mugs, putting them bottom first, one in each cell. Put beer glasses with stems with the stem facing the bottom of the cell pack. Finish with a layer of packing paper. Finish the uppermost layer of the box with bubble wrap and packing paper until all free space is taken. Seal with duct tape and shake the box a little bit to make a test if the mugs inside will move. If they are unstable, just open the box and add more packing paper or bubble wrap and re-seal.